Motor vehicle accidents can be devastating, and a traumatic brain injury (TBI) can be one of the most severe and life-threatening consequences of a car crash. The latest information from the Centers for Disease Control and Prevention (CDC) in Atlanta show that as of 2013, motor vehicle accidents were the third-most leading cause of traumatic brain injury-related hospitalizations, emergency room visits, and deaths. TBI-related death from vehicle accidents was the leading cause of death among people ages 5 to 24 years old. Open head injuries happen when the skull is fractured and something such as glass, metal, or bone fragments causes direct injury to the brain. These are often the most dramatic-looking injuries, as the scalp contains many blood vessels, resulting in the appearance of a lot of blood. All open head injuries are critical emergencies and need to be treated promptly. 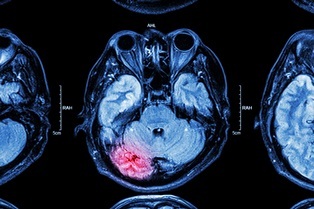 Not only is there an immediate risk of bleeding and life-threatening swelling of the brain, but the open wound can also lead to a deadly infection. Closed head injuries are the most insidious types of injury, and are often considered to be “silent killers.” Symptoms may be immediate, or delayed for hours, days, or longer. There is no penetration of the skull, and there may be no blood at all or just minor surface cuts and scratches. Closed head injuries can happen due to a blunt force impact on the head, such as on the steering wheel, dashboard, or window. Closed head injury can also happen with no impact at all, when the head is shaken or violently twisted at the moment of impact. No matter what type of head injury has happened or is suspected after an accident, if you think a head injury may have occurred, medical attention is an absolute must. The symptoms of a head injury may not be immediately noticeable to the victim or to onlookers, which is why it is critical to be seen by medical personnel after any suspected head injury or TBI. Concussions are the result of the brain being traumatized due to either impact or a change in momentum, such as a sudden deceleration when cars collide. Unconsciousness may result, but not always. Concussions may take weeks, months, or even years to heal. Contusions are when the brain becomes bruised due to the breaking of small blood vessels. Coup-contrecoup injuries are actually two contusion injuries that happen on opposite sides of the brain. When a violent impact or change in momentum stops the skull’s motion suddenly, the brain continues moving, slamming first into one side of the skull, then rebounding into the other side. Diffuse axonal injuries or shearing-type injuries result when the nerves of the brain are stretched past the breaking point by impact or rapid, violent rotation. It is called a “diffuse” injury because it can damage many parts of the brain across a wide region, not just at the point of impact. As the nerves tear, chemicals in the cells are released, causing further cell damage and death. Axonal injuries are often devastating, causing permanent brain damage, functional impairments, comas, and death. The effects of any TBI can last for months, years, or an entire lifetime, and care for a victim can get expensive fast. Evidence of a TBI from a doctor’s diagnosis can be an important part of your personal injury lawsuit and can help make sure that you receive the compensation that you are owed for medical bills, prolonged care, and rehabilitation therapy afterward. If you or someone you love has suffered a traumatic brain injury after a car accident in South Carolina, you are not alone. The Law Office of Kenneth E. Berger can help you seek justice after the devastating effects of a TBI, so that you can focus on recovery instead of worrying about the costs. Call us by phone, use the live chat box on this page, or click the contact link to consult with a lawyer today. ?Is a Concussion a Form of Traumatic Brain Injury? ?What Tests Should Be Performed When Someone Sustains a Brain Injury From a Car Accident? ?Which Doctor Should I See if I Sustained a Concussion from an Auto Accident in South Carolina?